When the Royal Albert Bridge over the River Tamar at Saltash was opened by the Prince Consort on 2 May 1859, cannons boomed, brass bands played, the crowds cheered and flags fluttered proudly to salute the final link in the great broad gauge route to the West. A few months later a sadder event took place as a lone engine hauling a flat wagon chuffed slowly across the Bridge. Lying on a couch placed on the wagon was the renowned Isambard Kingdom Brunel, the Bridge's designer and Engineer to the mighty Great Western Railway. Brunel was dying and this was to be his only sight of his completed masterpiece. Two years earlier he had supervised the floating out into the Tamar of the first massive Bridge truss from its place of building on the shore. Holding centre stage on a specially constructed platform on the truss he had used a system of flags to convey his instructions to an army of workmen, guiding their actions as a conductor might control a great orchestra. People paid a shilling for the best vantage points to see the spectacle, and when it was successfully completed a band struck up 'See The Conquering Hero Comes'. Overwork and the fate of his steamship Great Eastern broke Brunel, and not long after his lonely visit to the Royal Albert Bridge he died. 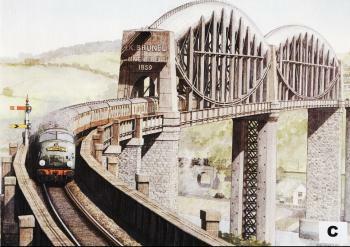 To commemorate his genius the Directors of the Cornwall Railway, the Bridge's owners, had the legend "I.K. Brunel Engineer 1859" placed on the Bridge. The lettering cost £15, the lowest of two estimates the money-conscious Directors had obtained. In its centenary year the Bridge was feted. It was floodlit during the summer and a specially commissioned poster showing 'Castle' Class 4-6-0 No. 5069 Isambard Kingdom Brunel on the Bridge was widely displayed. But increasingly the wheels which rumbled across the Bridge belonged to diesels not steam. The first examples of the Western Region's main line diesel-hydraulics had appeared the previous year and Cornwall was planned to be one of the first areas of BR to banish steam altogether. The 71 'Warships' were based on a successful West German Railway design but, like all the diesel-hydraulics, were withdrawn as non-standard after a relatively short life. The Western Region's determination to persist with hydraulic transmission while all about were choosing electric echoed Brunel's continued use of the broad gauge long after it was obvious he was out of step with everyone else. For all its shiny newness the 'Warship' in the picture is carrying the past along too, in the shape of the steam-age "Cornish Riviera Express" headboard and the rake of carriages painted in traditional GWR chocolate and cream. God's Wonderful Railway died hard!